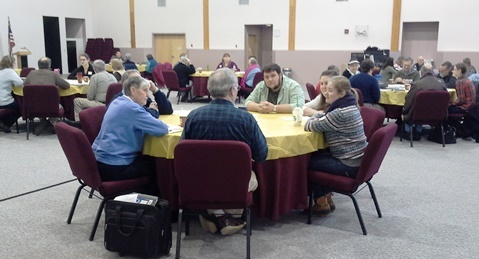 ABCUSA President Don Ng was invited by Al Fletcher, Executive Minister of ABC-Maine, to participate in a Table Conversation in the region as they jointly affirm and celebrate the importance of having Millennials and young adults in the life of the church. The reflection below was written by Ng about his experience at the January 3, 2015 event. People who live in Maine are tough and resilient. They know how to survive some of the harshest winters in some of the most remote areas in northern New England. Maine American Baptists are no exception. For years, they have remained faithful to the Gospel of Jesus Christ even when companies like paper mills have closed down and young adults sought viable employment in larger cities out of state. These realities have left many of the 140 plus Baptist churches looking for answers to declining memberships almost devoid of children, youth and young adults. Utilizing the format of Table Conversations that was enthusiastically affirmed by participants at the 2013 Biennial Mission Summit, over 40 people from 18 churches (6 Associations) came for a 6-hour conversation on the topic, “Creating Space for the Next Generation of Believers” at the China Lake Conference Center on Jan. 3rd. Regional Executive Minister Al Fletcher welcomed the group and introduced a 2014 video on “Making Space for Millennials by the Barna Group. To our surprise, this study discovered that Millennials find the quietness in church sanctuaries a more positive experience than a noisy hall. They also learned that Millennials are looking for community over privacy, a community that calls them to deeper meaning. The Millennial generation is generally understood to be people born in the early 1980s to the early 2000s making these youth and young adults between the ages of 14 to 24. After a time of worship, a panel of young pastors and I shared responses to questions such as: What gifts do you see Millennials bringing to your church? How do Millennials see the world differently from other generational groups? And what is the biggest opportunity that the church is currently missing related to Millennials? The group engaged in 4 rounds of conversations with the instructions to record ideas on post-its that would be used to share with others for continuing conversations. These conversations were lively and often went beyond the time allotted. Some of these questions to spark our discussions were: Where do you feel close to God? Where do you find sacred space in your life? How can churches help create authentic connections with God and others? How ready are you to change some of the habits and practices of your church to meet the needs of Millennials that may be different from the needs of others currently in your congregation? What price are you willing to pay to advance this possibility? anyone can remember, older people and Millennials and young adults were around the same table having deep and probing conversations with each other. We didn’t end up with quick fixes to decades-old problems. We discovered that older and younger members of the church could actually have a good conversation together. We practiced listening attentively and offered feedback carefully. We know that change won’t necessarily happen overnight but what we can affirm is that we planted some good seeds that in God’s time, we believe in the promise of renewal, transformation and new beginnings. It’s much better to start a conversation than to not try at all. And we did that in Maine! One of the Millennials told me that she had little expectation of what may happen and whether spending 6 hours just talking was worth her time. Afterward, she told me that she was glad she came and found out that today proved that God is working among American Baptists in Maine! While driving in Maine, I was told that the average home lot is about 2 acres because people who move to Maine don’t like to be bothered by their neighbors. At this Table Conversation, these Baptist neighbors meddle in each other’s church stuff with grace and respect. I believe that American Baptist churches can be dynamic and faithful when we care enough to be meddling neighbors for the sake of sharing the Gospel Good News with all people including older generations and Millennials alike! Maine is a modeling for the rest of the denomination how to create sacred space for all of God’s people!